"PIMCO" introduces the New Generation Inline Sheet Feeding system Granulator to cater the crying needs of the market. PIMCO continues to blaze new trails in the field of plastic Processing with deep commitment for constant development of quality products- and better services to plastic Industry, again a step ahead to give its Customer utmost satisfaction by fulfilling their demands. The Sheet feeding Granulator is designed in a view to serve the waste produced during production and to be reused at the same time. The speed of the Feed Roll Unit is adjusted according to the Sheet Iine production and the wastage rate by means of variable frequency drive. Three rotating and two fix blades are used to give optimum results. The Sheet is fed through the chute which passes through gripped Jaws to pull the sheet, and is uniformly fed to the Granulator chamber. 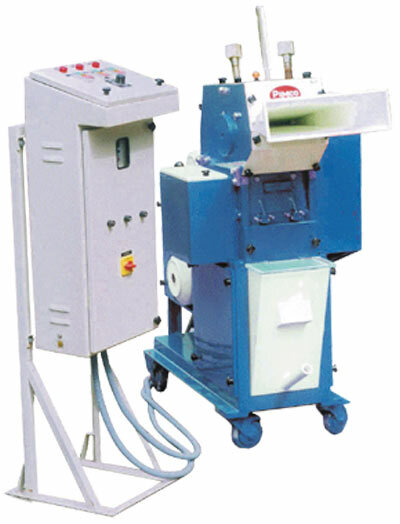 These machines are available in various models, depending upon the sheet width & also custom built machines can be produced. Compact and low sound level. Low power consumption with high output. Inline grinding prevents contamination & dust formation on scrap. Fully hygienic processing of food grade sheets. Easy & fast cleaning system. Due to continuous uninterrupted operation saves Iabour. Depends on Material, Sheet / Trim Thickness & feeding speed. Note - All specification are subject to change without notice for constant product development.